Ronald Gainer, the Roman Catholic bishop of the diocese of Harrisburg, Pa., discusses child sexual abuse by clergy during a press conference on Wednesday in Harrisburg, Pa. A partially redacted, roughly 900-page grand jury report about abuse by priests in Pennsylvania has been ordered to be made public within weeks. In 2016, Pennsylvania’s attorney general launched a grand jury investigation, into allegations of sexual abuse in six of the state’s eight dioceses. The investigation was conducted under “the umbrella of secrecy,” court documents note. It came closely after a 2016 grand jury investigation that found evidence that two bishops in the Altoona-Johnstown diocese covered up sexual abuse by dozens of church leaders. Individuals named in the document have protested its release, but last week, a judge ordered that the report be made public. He called for “temporary redactions” as necessary to protect reputations of people concerned with their due-process rights. The 900-page report must be released by August 14. In the meantime, court documents reveal two short previews. Even before the release of the report, its very existence has shifted the conversation in two dioceses. The diocese of Erie released the names of people affiliated with the church who were “credibly accused” of misconduct involving children, including sexual abuse. The diocese did not release details about the allegations. The bishop of Harrisburg, Ronald W. Gainer, not only named the accused former members in his diocese but struck their names from church buildings. His list did include some broad details about the allegations, while also making it clear that it described accusations, not proven misconduct. “Bishop Gainer has determined that anyone who has been accused of sexual misconduct and appears on our list will have their name removed from any position of honor throughout the Diocese,” the diocese said in a statement. The names of every single bishop since 1947 will also be removed from diocese properties — because as leaders, they mishandled the cases of abuse under their watch, Gainer wrote. The diocese has also formally waived the confidentiality provisions of all previous settlement agreements with survivors of abuse, and established a website for survivors. 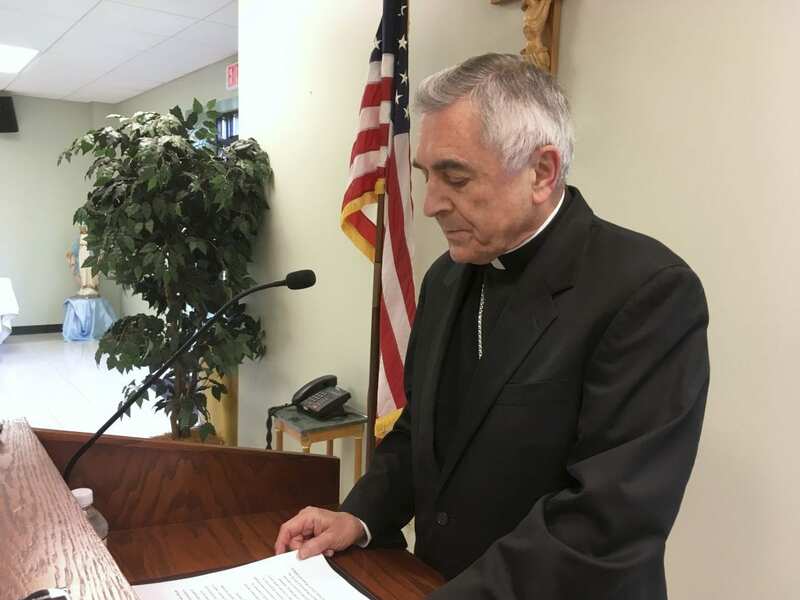 “While these past harms cannot be undone, it is my hope that today I can do m part, as the present Chief Shepherd of the Diocese, to salve some of these historic wounds with the healing touch of transparency,” Gainer wrote. The steps taken by the diocese have been cathartic for at least one survivor. Todd Frey told the York Daily Record that when he saw his abuser’s name on the diocese’s list — and saw that there were multiple allegations against him — he began to cry. He knew he wasn’t alone. “It’s like…suddenly I don’t feel like I’m going to Hell,” he told the newspaper.